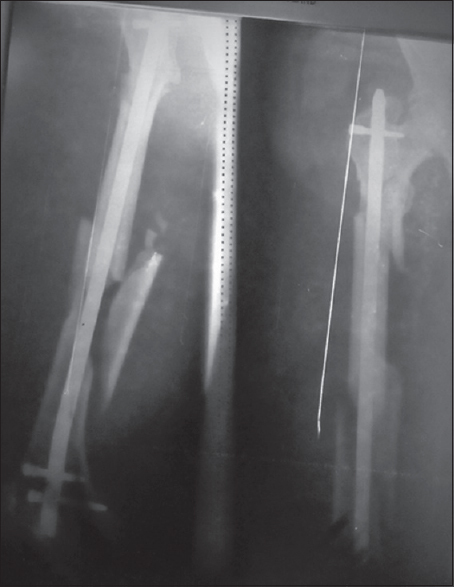 Locked intramedullary nailing has transformed the management of long bone fractures. Intramedullary nails act as load-sharing devices in fractures and are subjected to smaller bending loads than plates. Thus, they are less vulnerable to fatigue failure and patients can be mobilized as early as the first postoperative day. Additionally, stress shielding with resultant cortical osteopenia, commonly seen with plates and screws, is avoided with intramedullary devices. Therefore, refracture after implant removal is rare with the use of this device. There is also lower infection rate and higher union rates with minimum scarring with intramedullary nailing. This is because extensile exposures required in plate fixation are not necessary and with image intensifier both fracture reduction and implantation of the device can be done as a closed procedure. Intramedullary nailing can be deployed in the management of long bone diaphyseal fractures as well as most cases of long bone metaphyseal fractures and even in periarticular fractures. In most cases, especially in advanced countries, an image intensifier is a prerequisite for the procedure. This permits minimal access surgery where closed reduction is possible while the nail is inserted with the aid of a guide wire. The high cost of acquisition and maintenance of image intensifiers has made the equipment scarce in most developing countries. This has lead researchers to over time develop techniques of interlocked intramedullary nailing that is possible without an image intensifier., These techniques deploy external target devices to aid the placement of interlocking screws. They have the added advantage of eliminating the exposure of the patient, the surgeon, and other theatre personnel to ionizing radiation. Among the devices is that designed and produced by the Surgical Implant Generation Network (SIGN). The organization has made the instruments and implants readily available in the developing countries including Nigeria at zero cost. Thus, thousands of patients have been operated on using this technique. The aim of this work is to report our experience with the use of SIGN intramedullary nailing in both tibia and femoral fractures. This was a hospital-based prospective descriptive study involving 52 consecutive patients seen over a 2 year period. All patients following an informed consent were offered interlocked intramedullary nailing of the femur and/or tibia within the 2 year period under review and were included in the study. The procedures were performed using the SIGN implants, instruments, and technique protocols. Each patient received antibiotic prophylaxis, starting 1 hour before surgery. Physiotherapy was commenced the day after surgery, when graduated crutches weight bearing was also started. The follow-up X-rays taken immediately after the surgery, at 6 weeks, 12 weeks, and then monthly were reviewed. The patients were followed up for a minimum of 12 months. Fracture union was recorded when there was absence of pain at fracture site and X-ray shows presence of bridging callus in two orthogonal views. 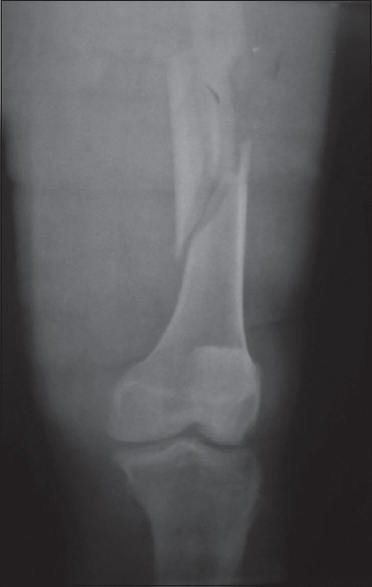 Delayed union was taken as fracture that failed to unite between 4 and 9 months, whereas nonunion was defined as a fracture that failed to unite after 9 months. All closed fractures of the femur and tibia/fibula seen within the period under review were included in the study. However, open fractures, malunited fractures and cases of fracture nonunion were excluded. Any wound in the affected limb was treated and allowed to heal before surgery. As is routine with all implant procedures sepsis in any part of the body was a contraindication to surgery. This has to be addressed before proceeding. If the limb was in a cast, the cast was removed the night before surgery and the limb thoroughly washed. Templating was done with the X-ray the day before surgery to be sure that the appropriate nail and screw sizes were available. This was despite the fact that our implant set with range of sizes was always available and sterile during each surgery session. The patients received first dose of prophylactic antibiotic about 1 hour before surgery. We routinely used spinal anesthesia for the surgery. The patients were placed supine on the operating table for tibia fractures and retrograde femoral nailing, whereas for antegrade femoral nailing, they were routinely placed in the lateral position with the affected side uppermost. For tibia nailing and retrograde femoral nailing, we normally used a triangular wooden device placed under the limb to achieve some 45 to 60° flexion at the knee. This device was placed under the drapes to avoid contaminating the operation site. Open reduction was done in all cases without an image intensifier or fracture table. We routinely achieved fracture reduction before reaming. For the tibia, the entry point was just above the tibia tuberosity, following a midline incision. In the retrograde femoral nailing technique, the entry point was the point just above the intercondylar notch. This was approached through a split patellar tendon incision, and the entry point was visualized after minimal dissection of the fat pad and securing hemostasis. In the antegrade femoral nailing technique, the greater trochanter was approached through a small incision. The entry point to the femur in this approach was the posterolateral aspect of the greater trochanter. A curved awl was used to create the entry point at the chosen site and this was then widened and connected to the medullary cavity with increasing sizes of reamers. Once this was achieved, the medullary cavity was sequentially reamed until chatter is felt. The selected nail was 2 mm or 2 sizes less than the diameter of the reamer that created the chatter effect. The proximal 4 cm from the entry point was then over reamed to 4 mm of the chosen nail diameter. This was to create room for the proximal curve of the nail. The expected nail length was measured using a blunt reamer, which was placed alongside the bone without touching the skin. We routinely save the bone and fluid released through the flutes of the reamers in a gallipot. This was placed around the fracture site before wound closure to accelerate fracture union. The chosen nail was then coupled to the external target device as specified in the SIGN techniques manual. Once the slots on the target device were aligned to the ones on the nail, the target device was removed and the nail was ready for insertion. The fracture which had been reduced was held with a pair of reduction clamps. The nail was then inserted into the medullary cavity with a tissue protector around the entry point to prevent the nail from touching the skin. Overreaming ensures that the nail moves smoothly in the cavity. We, however, encountered some difficulty in a few cases where we had to tap the head of the nail gently with a mallet to drive it in. As this was done, one of the assistants gave a counter pressure on the other end of the bone and the reduction was inspected intermittently. Excessive force was avoided to prevent bending of the nail, which will cause loss of alignment with the external target device. The nail was left proud to about 3 cm above the cortex to aid coupling of the external jig for interlocking and also for later removal if indicated. The locking bolt was checked and tightened as it usually loosens during nail insertion. The target device was then recoupled. The distal interlocking screws were inserted first and they are usually more difficult to locate. The alignment pin was used to determine the site of incision for interlocking. The most distal screw was inserted first. The incision was made and extended down to bone and the periosteum elevated. The large drill guide was then inserted through the incision and anchored on the bone by taping on it with the mallet. The small drill guide was next inserted and the near cortex of the bone drilled through the guide. The small drill guide was then removed and the hole widened with the step drill. Once the step drill engages the nail slot, a locking feel is felt. Care should be exercised as excessive force may break the step drill at this point. The step drill was removed and the hole widened with the screw hole broach. The slot finder was inserted to locate the hole in the nail. Once it engages the hole, a locking feel is observed and this is called the SIGN feel. The screw length was measured and inserted. The length of screw chosen is usually about 5 mm above what is measured so that the screw head will be proud after insertion for ease of later removal if necessary. Insertion of the second distal screw was aided by placing the alignment pin on the head of the first screw. This was maintained in position by an assistant until the screw was inserted. The process for insertion of the first screw was then repeated. The proximal holes were then locked. This is often easier and does not require the slot finder. It followed the process earlier described and the screws were inserted. On a few occasions, we encountered so much difficulty in finding the distal slots. In these cases, we had to widen the soft tissue incision, then also widen the cortical window as much as possible using the screw hole broach. Having done this, the target device was removed and the nail rotated until the hole is located by direct vision. The target arm was then reattached, the slot finder inserted into the hole, and the procedure completed as earlier described. This ensured that locking was achieved in all the cases we managed. The target device was then detached through the locking bolt and wound irrigated and closed in the routine way. We used a vacuum drain in all our cases. In the period under review, 54 patients with 57 fractures were managed. 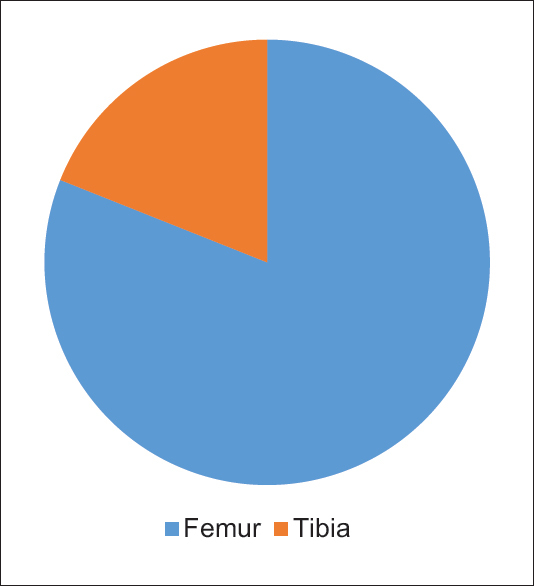 There were 46 femoral fractures (81%) and 11 tibia/fibula fractures [19%, [Figure 1]. One patient had bilateral femoral fractures, whereas 2 patients had fractures of both femur and tibia/fibula. There were 47 (87%) males and 7 (13%) females with a male to female ratio of 6.7:1 [Table 1]. The age range was 19--60 years with most patients within the 31--40 years age bracket (n = 25, 46%), and the mean age was 34.5 years. All the cases were as a result of motor vehicle accident. All the cases were also fresh and closed fractures. Thirty six (78%) of the femoral fractures were operated through the antegrade approach, whereas the rest (22%) was through the retrograde approach. Both proximal and distal interlocking was achieved in all cases, with an average operating time of 90 min. Each case was followed up for a minimum of 1 year. 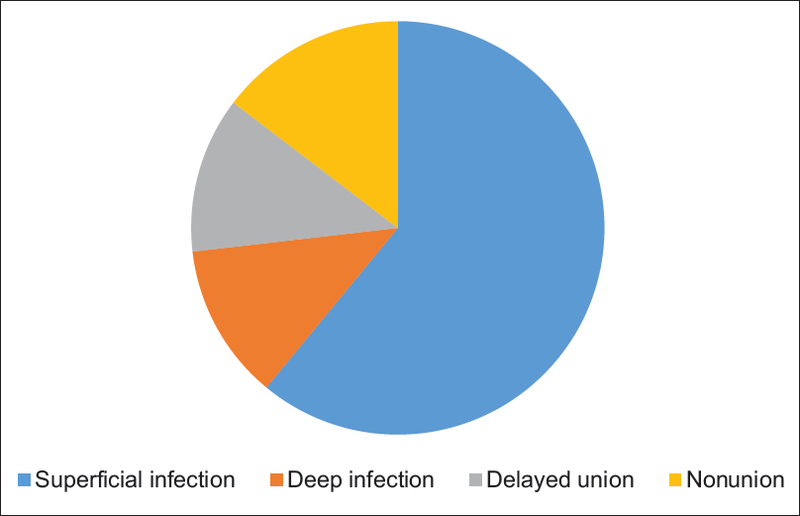 Fracture union was recorded in 56 (98%) patients. Complications were recorded in 8 cases [14%, [Figure 2]. These included five cases of superficial infection, which healed with dressing and antibiotics, one case of deep infection that required implant removal after fracture union, one case of delayed union that required dynamization, and one case of nonunion that required exchange nailing and bone grafting. [Figure 3], [Figure 4], [Figure 5], [Figure 6], [Figure 7], [Figure 8], [Figure 9], [Figure 10], [Figure 11], [Figure 12], [Figure 13] show the preoperative and postoperative X-ray films of two of the cases with comminuted and segmental fractures of the femur, respectively. Trauma is one of the leading causes of morbidity and mortality worldwide.,, The impact is worse in the developing world where the response to cases of trauma is usually less than desired. The mode and speed of evacuation of victims are usually not satisfactory leading to worsening outcome of cases. This is coupled with the fact that the victims often resort to management by quacks like traditional bonesetters. The later may be because of ignorance or poverty and often due to both. This is complicated by the fact that most individuals in these climes have to pay out of pocket for medicare as health insurance covers only an insignificant proportion of the populace. Thus, most people cannot finance their treatment in hospitals. One can then imagine the impact of disease generally in this part of the globe. The hospitals on the other hand are faced with the dearth of basic facilities and this contributes significantly to poor treatment outcomes and as a consequence lack of confidence of the populace in the healthcare facilities. The choice of approach for nail insertion in femoral fractures, whether retrograde or antegrade, was determined by the position of the fracture. 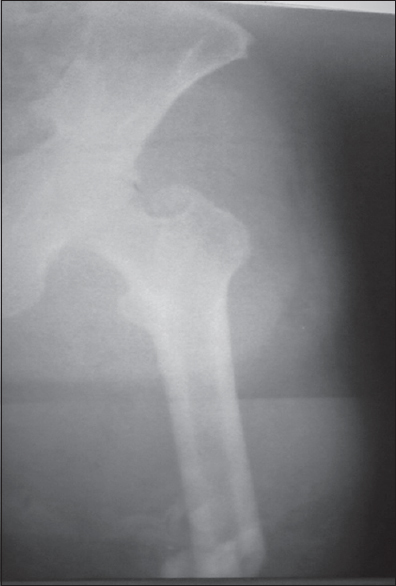 Fractures located in the distal half of the femur were approached through the retrograde route, whereas those in the upper half were approached through the antegrade route. We did not notice any difference in outcome between the two approaches. Retrograde nailing is also recommended in obese patients and pregnant women, although we did not have the need to use the approach for these indications. There was also no difference in outcome between femoral and tibia nailing in our series. We achieved both proximal and distal locking in all our cases. In a few cases, we had some difficulty with locating the distal slot. In these cases, we had to enlarge the skin incision and also the cortical window, after which the slot was located by direct vision and free hand before proceeding with the target device. This led to increased surgical time as a disadvantage but ensured that distal locking was achieved in all the cases. However, the average surgery time of 90 min was still within acceptable limit. The choice of whether to lock one or both distal slots was made based on the stability of the fractures. In the more stable fractures, only one distal slot was locked. We also considered finance in making this decision so as to cover as many patients as possible with the available locking bolts. We reamed all the cases to accommodate larger nails so as to improve the stability of the fixation. Another advantage of reaming is that the fluid released through the reamer flutes also helps to accelerate fracture healing. We routinely collect this fluid and place it around the fracture site prior to wound closure. The rate of fracture union in our study was 98%, which is comparable to what was obtained in similar studies elsewhere., The high rate of fracture union following intramedullary nailing may be due to a number of factors. The degree of soft tissue dissection and periosteal stripping is much less with nailing as compared with plating and this may contribute to the higher rate of union observed. Also, early mobilization following locked intramedullary nailing with the resultant early loading of the fracture can also have a positive impact on the rate of union. We recorded complications in 8 (14%) of the cases we managed. These included 5 cases of superficial infection, one case each of osteomyelitis, delayed union, and nonunion. The cases of superficial infection were managed by wound debridement, serial wound dressing, and antibiotics. The wounds eventually healed and fractures healed without further complications. 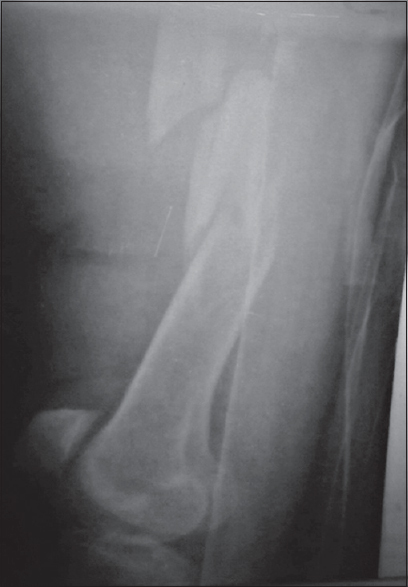 The case of osteomyelitis required wound debridement, followed by suppressive antibiotic therapy. 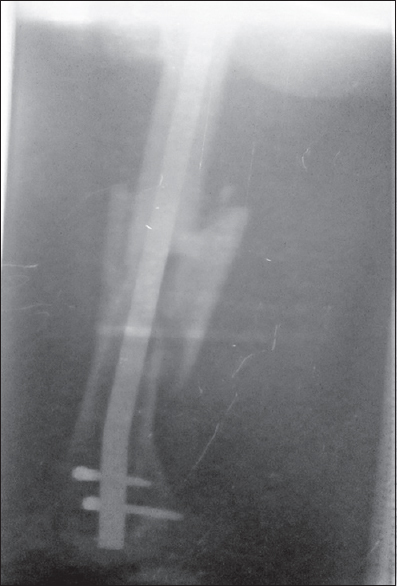 The fracture eventually healed after which the implant was removed and sequestrectomy and curettage done, followed by antibiotic therapy for about 6 weeks. The infection thereafter resolved completely. The low infection rate observed compares with that seen by some other authors., This may be related to relatively small incision site and less tissue dissection and periosteal stripping when compared with plating. For the case of delayed union, we carried out dynamization of the fixation at 7 months postoperative period. The fracture eventually healed within 6 months of the intervention. Exchange nailing and bone grafting was done for the case of nonunion after 18 months of the procedure and fracture union was eventually achieved. We did not record any case of screw cut-out or breakage in our series. Neither did we observe any case of nail breakage. All the cases of retrograde femoral nailing, however, had some degree of knee stiffness, which however resolved completely with physiotherapy. The SIGN technique of locked intramedullary nailing which does not require the use of image intensifier, power reamers, and fracture table gives a good result. The technique is therefore recommended in the developing countries where the aforementioned equipment is not readily available. Reudi TP, Buckley RE, Moran CG. AO Principles of Fracture Management. 2nd ed. Switzerland: AO Publishing; 2007. p. 257-8. Wood GW. Intramedullary nailing of femoral and tibial shaft fractures. J Orthop Sci 2006;11:657-69. SIGN Fracture Care International. Available from: http://signfracturecare.org/. [Last accessed on 2018 May 01]. Phillips L, Zirkle LG, Gosselin RA. Achieving locked intramedullary fixation of long bone fractures: Technology for the developing world. Int Orthop 2012;36:2007-13. Krug EG, Sharma GK, Lozano R. The global burden of injuries. Am J Public Health 2000;90:523-6. Lopez AD, Begg S, Bos E. Demographic and epidemiological characteristics of major regions, 1990-2001. In: Lopez AD, Mathers CD, Ezzati M, Jamison DT, Murray CJ, editors. Global Burden of Disease and Risk Factors. The International Bank for Reconstruction and Development/The World Bank. Washington, DC, New York: Oxford University Press; 2006. p. 1:17-44. World Health Organization. World Health Statistics. 2010. Available from: http://www.who.int/whosia/whostat/EN_WHS10_Full.pdf. [Last accessed on 2018 May 01]. Shar RK, Moehring HD, Singh KP, Dhahal A. SIGN IMN of open fractures of the tibia. Int Orthop 2004;28:163-6. Steriopoulos KA, Kontakis GM, Katou PG, Galanahis IA, Dretahis EK. Placement of the distal locking screw of the femoral intramedullary nail without radiation. Arch Orthop Trauma Surg 1996;115:43-4. Buckley R, Panaro CD. General principles of fracture care. 2007. eMedicine. Available from: http://emedicine.medscape.com/article/1270717-overview. [Last accessed on 2018 May 01]. 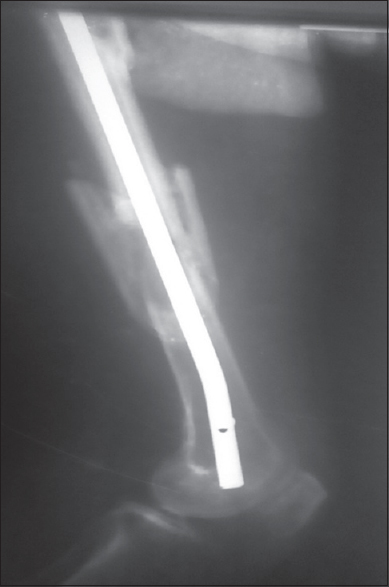 Gosselin RA, Heilto M, Zirkle L. Cost effectiveness of replacing skeletal traction by interlocked intramedullary nailing for femoral shaft fractures in a provincial trauma hospital in Cambodia. Int Orthop 2009;33:1445-8. Bhat AK, Rao SK, Bhaskarand K. Mechanical failure in intramedullary interlocking nails. J Ortho Surg 2006;14:138-41. World Report on Road Traffic Injury Prevention. Geneva: World Health Organization; 2004. Kobusingye OC. Why poor countries cannot afford to ignore road safety. Afr J Trauma 2004;2:6. Ikem IC, Oginni LM, Bamgboye EA. Open fractures of the lower limb in Nigeria. Int Orthop 2001;25:386-8. Onabowale BO, Onuminya JE, Essien IA, Ukegbu ND. The management of open tibial shaft fractures: The national orthopaedic hospital experience. Nig J Surg 1995;2:37-42. Nwagbara IC, Opara KO, Enweani UN: Surgical accidents and emergencies. The experience of Imo State university teaching hospital, Orlu. Niger J Surg Sci 2010;20:11-6. Ikpeme I, Ngim N, Udosen A, Onuba O, Enembe O, Bello S. External jig-aided intramedullary interlocking nailing of diaphyseal fractures: Experience from a tropical developing centre. Int Orthop 2011;35:107-11. Babalola OM, Ibraheem GH, Ahmed BA, Olawepo A, Agaja SB, Adeniyi A. Open intramedullary nailing for segmental long bone fractures: An effective alternative in a resource-restricted environment. Niger J Surg 2016;22:90-5. Young S, Lie SA, Hallan G, Zirkle LG, Engesaeter LB, Havelin LI. Low infection rates after 34,361 intramedullary nail operations in 55 low- and middle-income countries: Validation of the Surgical implant generation network (SIGN) online surgical database. Acta Orthop 2011;82:737-43. Wild M, Gehrmann S, Jungbhuth P, Hakimi M, Thelen S, Betsch M, et al. 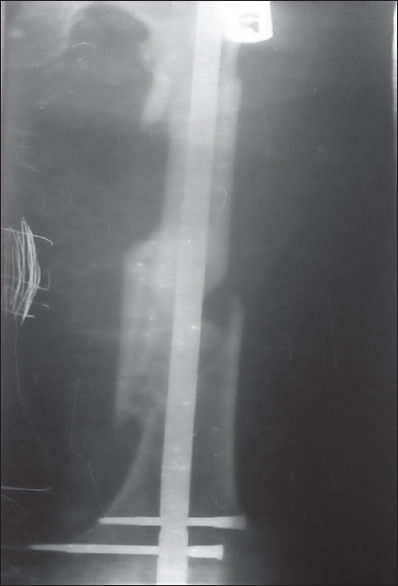 Treatment strategies for intramedullary nailing of femoral shaft fractures. Orthopaedics 2010;33:726.